Left: Red Fox Skin. See a size comparison with a soda can. Right: Red Fox Skin With Feet. 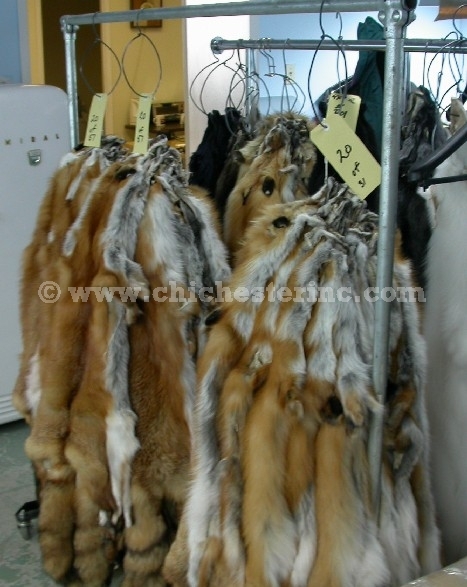 We offer a variety of uncased red fox skins. The red fox with feet are generally good quality skins with hair that may or may not lay flat. Without the head or tail, these measure 22" to 23" long. There is some variation in color. We also have a selection of these skins listed on our gallery. The trading post grade are a good quality skin without any obvious defects; they are ideal for hanging on the wall of your house or cabin. The skins measure approximately 30" to 33" from tip of the nose to base of the tail and 5" wide. Without the head or tail, these measure 22" to 24" long. The craft grade skins have obvious flaws (rips, tears, holes, or slips) and are perfect for craft projects. They may or may not have tails. The reject skins have many problems and are best suited for cutting into smaller pieces. They may or may not have tails. Please call if you have any questions. Click HERE for a picture of the number of red foxes available. Red fox are not an endangered species and are not subject to CITES controls.